6 January Birthstone Jewelry Pieces That Would Make for a Perfect Gift! Birthstone jewelry is popular for a reason. Not only does it give you the ability to buy a loved one jewelry, but inexpensive jewelry as well. Birthstones have a brilliant sparkle and shine to them that you wouldn’t expect. You can guarantee that with the right piece, you’ll be giving someone a stunning gift that they will appreciate and remember for years to come. Below are our 6 favorite January birthstone jewelry pieces that make the perfect and affordable gift for every occasion. 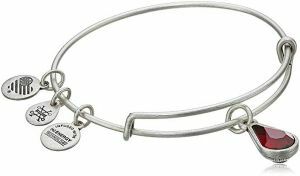 Alex and Ani are easily one of the most popular modern jewelry companies in North America. 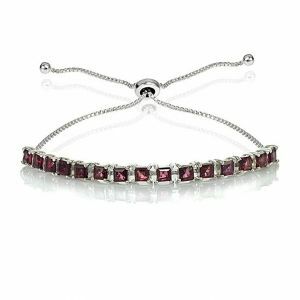 Not only will you be receiving a garnet Swarovski crystal, but you’ll also receive the entire bangle as well. Crafted out of Rafaelian silver or Rafaelian gold, it’s a stunning piece for anyone of any age. If you’re looking for multiple gifts, you can also choose from any other month. The best part is that the charm bracelet opens the door for future gifts, as you can give more charms to add to the bangle. If you’re not too interested in giving a bracelet and are looking for something a little more traditional, this beautiful necklace is an option. Designed and crafted for the Amazon Collection, the sterling silver necklace is a show stopper. 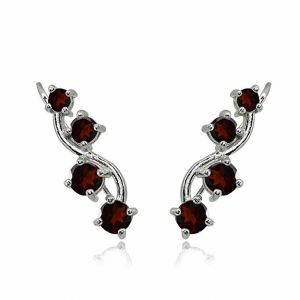 You’ll have the stunning garnet gemstone and a diamond accent bow to pull the whole piece together. Carved into the shape of a heart, it’s the type of gift that shows someone how much you love them. 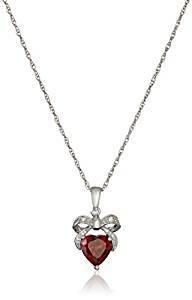 What makes this garnet necklace particularly special is that the gemstone is specially treated. This helps to ensure its durability and appearance is above the industry average. Also, the diamonds included in the necklace comply with the Kimberly Process. This helps to ensure that they are conflict-free. Instead of a traditional pair of studs, why not opt for something a little more decorative? These spectacular vine earrings are beautiful enough to wear for a more formal occasion. They are also the perfect focal piece for an everyday outfit. If you’re looking for a gift for someone who loves more earth-inspired and bohemian pieces, this is a great option. The garnet is what helps to set the stage, as it creates a stunning contrast against the sterling silver. However, if you’re looking for other options, there are other gemstones to choose from as well. Crafted from fine sterling silver, they are nickel and tarnish free, which means you’ll be protecting your investment. You’ll also receive the earrings in a pouch, so they’re perfectly packaged and ready to gift. 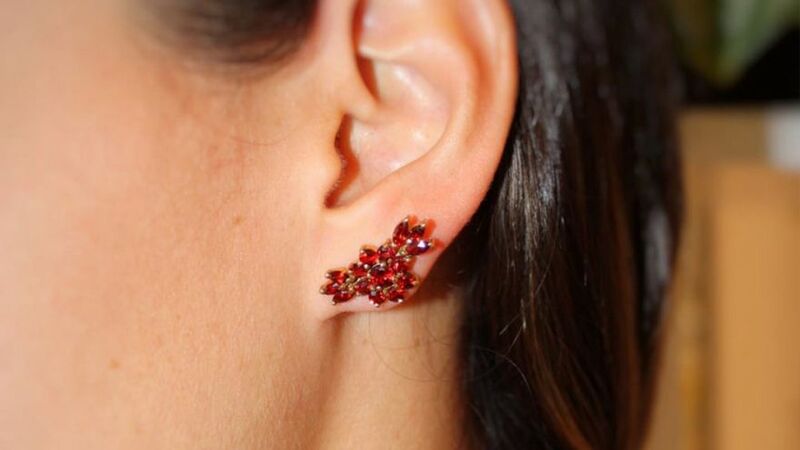 The most beautiful part of the GemStar USA Sterling Silver Vine earrings is the alternating sizes of the garnets. They start with two smaller garnets at the top and beautifully finish the design with two larger garnets at the bottom. Each is gently encased in their settings so that the gemstone can be admired with ease. 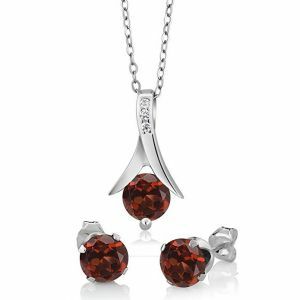 Perfect for the type of person that is looking for an all-inclusive gift, this garnet set is above and beyond. Not only is it incredibly affordable but you will receive both a necklace and pair of earrings in the set. This means you won’t have to worry about finding two separate pieces that work together. The total carat weight of the garnets is 2.25 CT and they are made entirely in the United States. The sterling silver used to construct the chain and the earring posts are high-quality lead-free. It’s incredibly shiny and simple to maintain over the years. Each set goes through rigorous inspections to ensure that they are suitable to be worn on an everyday basis. Bracelets are a phenomenal piece to add to anyone’s collection. This is especially true if the person you’re shopping for already has their favorite pair of earrings and a necklace. This gorgeous bracelet is something that can double as a casual and formal piece. This helps to make it easy to wear and it’s also appropriate for anyone of any age, especially as the bracelet is fully adjustable. Each garnet is 3mm and is princess cut, which brings a new twist to traditional tennis bracelets. It’s also designed with a bolo clasp, so you can adjust it from 3 to 10 inches. Similar to the other GemStar USA piece on this list, the fine sterling silver is nickel and tarnish-free. Additionally, it comes prepared in packaging so it’s ready to give as a gift as soon as it arrives. What better way to show someone you’re thinking of him or her than to give them a guardian angel? The Woodstock Chimes Garnet Guardian Angel is the perfect combination of sweet and stunning. Not to mention this design is available in all 12 birthstones, which makes it the perfect gift for everyone in your family. Created using genuine Austrian crystals, the garnet wings of the guardian angel work perfectly against the clear crystals. Known as the gemstone that represents health, prosperity, and strength, you’ll be giving a gift that means a lot and looks great at the same time. Compared to the other pieces on this list, the guardian angel isn’t a piece of jewelry but instead a piece that can be affixed to a wind chime. However, with the right jewelry making tools, you can turn it into a luxurious pendant with ease. Finding garnet jewelry is quite simple, especially as gemstones are quite popular. As arguably one of the more beautiful gemstones that you can find, its deep red hues compliment nearly any outfit. No matter if you’re looking for a formal piece to be worn for a wedding or a casual pair of earrings for everyday wear, the options are endless. We can guarantee that you’ll be able to find the perfect gift for your special someone on this list.